Parts list: N°1 climbing ladder with protective panels which act as a handrail made ​​of mahogany plywood okoumé grooved phenolic-glued and no edges. Treatment with potting colored non-toxic paint and finished with wax-based water-soluble. 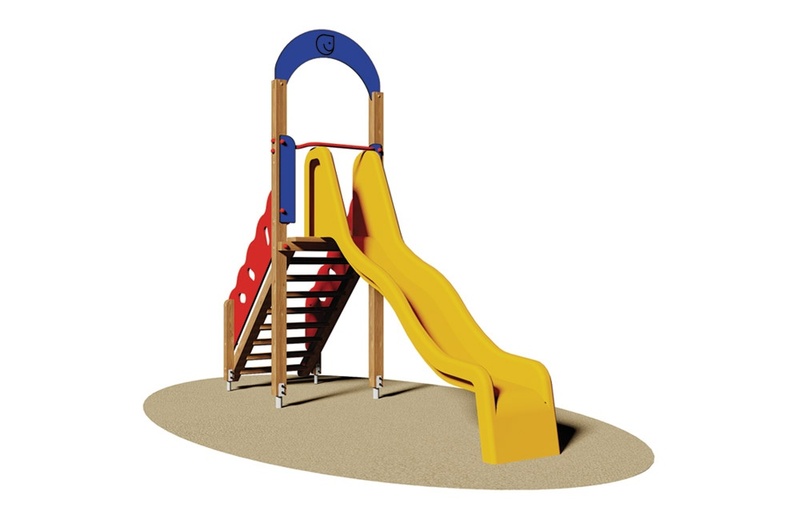 N°1 slide fiberglass h. 134 cm made ​​of corrugated layers of high density resin with a track length of 300 cm. The two elements are connected to two uprights of sect. 9x9 cm at the top that are joined by a panel of mahogany plywood okoumé shaped and grooved phenolic-glued. Treatment with potting colored non-toxic paint and finished with wax-based water-soluble. Complete structure of the safety handle steel tube shaped and painted in the oven to 180 degrees. Assembled by 8.8 galvanized steel bolts and nuts. Elements covernut under colored nylon. Attacks galvanized metal for anchoring to the ground.